One of the main factors in keeping your birds happy and fit is good nutrition. Just like us, our companions require proper nutrition to maintain a healthy lifestyle. Birds require a great deal of care and attention, even though they are small and caged. If you take proper care of your bird you will be able to experience the unique companionship they can offer. There is a blend of nutrients in pellets and with each bite your companion is receiving the healthy nutrition needed. Because pellets contain vitamins and minerals necessary, supplements are usually not needed, unless prescribed by your veterinarian. In addition to the pellet diet, it can be very beneficial for birds to be fed some vegetables, small amounts of fruits, and table food (pasta, whole wheat bread, small amounts of meat, and cheese). There are toxic foods you should avoid feeding to your companions, such as chocolate, avocados, caffeine, excessive amounts of table salt, onions, alcoholic beverages, tea, milk, spinach, rhubarb, and parsley. Be sure to check with your veterinarian before you feed your companion any table foods. Seeds are high in fat and birds tend to gain weight with over consumption, as well as having difficulties with calcium absorption. The old rumor of sunflower seeds being addictive is false. So if you are trying to decide between sunflower and safflower, keep this in mind—safflower seeds are bitter and birds will consume fewer as opposed to sunflower. Do not let your companion consume apple seeds, or the pits from cherries, plums, apricots, or peaches. The food your companion eats is made from a variety of ingredients and it is important to make sure they are receiving the proper amount of (1) water, (2) proteins, (3) carbohydrates, (4) lipids, (5) minerals, and (6) vitamins. Water is the most important nutrient for your bird; it provides a medium for digestion, absorption, transportation, metabolism, and cellular waste removal. Proteins help maintain kidney and liver health in your companion. 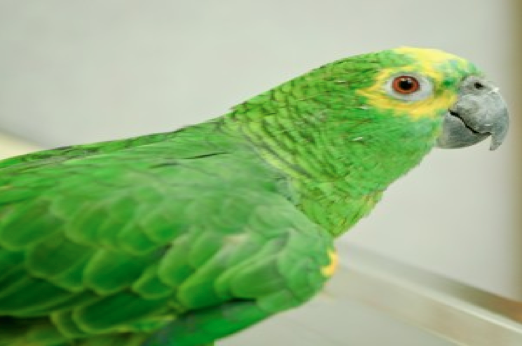 Carbohydrates give your bird energy and promote the movement and digestion of food. Lipids are fats and are essential for energy and birds need those essential fatty acids. Minerals needed by animals are calcium, phosphorus, sodium, potassium, chloride, magnesium, and sulfur. Vitamins A, D, E, and K are vital to a healthy diet for your companion. Most disease in caged birds is from poor hygiene, malnutrition and stress. Birds tend to hide their symptoms because of their fear and animal instinct to remain in the flock. These are some symptoms that can easily be spotted: eye discharge, color change, or swelling; nostril discharge, blockage, or soiling of feathers around nostrils, and sneezing; loss of appetite; lethargia; change in vocals; weight loss; inability to perch; swollen joints or feet; visible lumps or masses; open-mouth breathing when at rest; and bleeding (always an emergency situation). 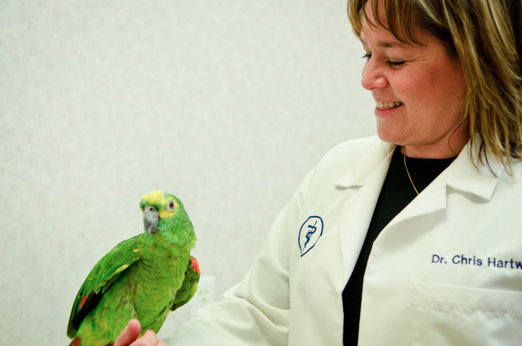 Delavan Lakes Veterinary Clinic specializes in bird health. If you have any questions about what you are feeding your companion or how its health and well being is, feel free to call and set up an appointment today, (262) 728-8622. Happy chirping!